Searching for a luxury Valentine’s getaway a short hop from London? 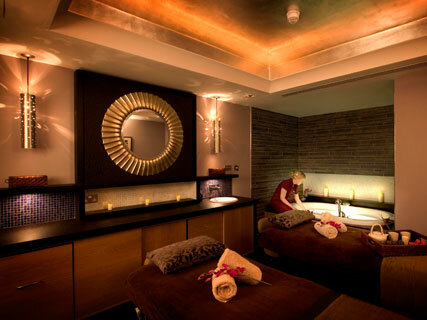 Look no further than the Grosvenor Pulford Hotel and Spa. Whether you’re after quiet weekend bolthole, a luxurious spa break, or a deliciously romantic Valentine’s getaway, this cosy retreat has it all. Nestled, ideally, in rolling countryside on the outskirts of town, it’s a convenient 10-minute ride from the station – far enough away from the hustle and bustle to afford some quiet bliss, but close too all those city essentials, should you need them. Thanks to a super-speedy Virgin train line, it’s a swift two-hour trip from London (perfect to sweep your Valentine away on a last-minute Friday getaway), and straight into R&R. And there are no formalities here – we guarantee you’ll feel right at home the second you step over the threshold. From the cosy Nelson’s bar, to the old-meets-new reception, the hotel is packed with quiet corners and inviting chairs, perfect for whiling away an afternoon. Rooms are, well, roomy – light and spacious, with a touch of chic country cosiness into the bargain. Think sprawling beds, stylish cushions, and oodles of peace and quiet. The perfect place for a romantic getaway come Valentine’s Day, or any other day, in fact. If it’s total relaxation you’re after, a trip to the hotel’s swimming pool, steam room and sauna – preferably via the fabulously redeveloped £3 million spa – is certainly in order. With a sparkling Turkish Hamman to rival anything I’ve seen in London, and a suite of to-die-for treatment and relaxation rooms, it’s the perfect urban oasis. And if love is in the air? The hotel has arranged a whole host of romantic Valentine’s treats, including the sweet smelling (and truly scrumptious!) Chocolicious Romance treatment. A ridiculously relaxing two hours later, you’ll emerge scrubbed, moisturised and completely refreshed, having been polished and pampered with an array of chocolate flavoured products.Yum. If you’re can bare the thought of dragging yourselves to dinner after such a day of R&R, a visit to the hotel’s chic Mediterranean brassiere Ciro’s is well worth the trip. Dine in glittering candlelight on fresh, local produce, washed down with one of the endless selection of wines. By now, I highly suspect you’ll be ready for bed. And if, at the end of your dreamy day, you’re not asleep the second your head touches the pillow, you deserve a medal! Details: The Grosvenor Pulford Hotel and Spa, Pulford, Chester, CH4 9DG (01244 570560; grosvenorpulfordhotel.co.uk). Classic rooms start from £135 per night, while Valentine’s breaks start from £47.50 per person. The chocolicious spa package starts at £125, Monday-Thursday. For information on Virgin train travel, visit, virgintrains.co.uk.